US Secretary of State John Kerry warned that “‘atrocities’” such as the second vehicular terrorist attack in less than two weeks in Jerusalem, would further aggravate conflict on the ground. On Wednesday, a Palestinian motorist drove into pedestrians at the roadside. But in a meeting today with Kerry in Paris, Jordanian foreign minister Nasser Judeh rebuked Israel for its “‘continuous violations and unilateral actions,’” against Jerusalem. For this reason, Amman withdrew its ambassador consultations in Tel Aviv on Wednesday. Abdullah Ensour, Jordan’s Prime Minister, instructed Judeh to lodge a complaint to the United Nations Security Council against the Israeli violence in Jerusalem, according to Dana Daoud, a spokeswoman at the Embassy of Jordan in Washington. 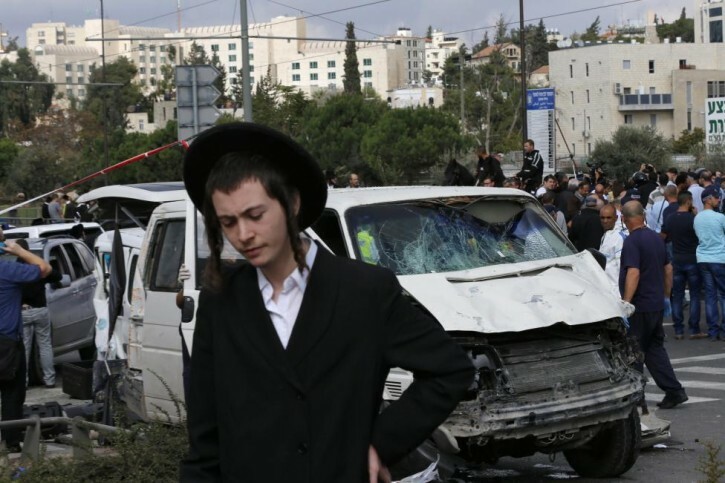 An Orthodox youth stands in front of the scene of an attack by a Palestinian motorist on innocent bystanders in Jerusalem.